This is my first nixie clock, based mostly on the circuit located at http://www.electricstuff.co.uk/nixclock.html. Click here for the schematic diagram of my nixie clock. I've modified some of the original design to solve a few problems and to suit some of my preferences. The clock was experimental until I picked up some experience with the circuitry. I experimented with the idea of building an alternating display using two B-5560 nixie tubes but ended up using 4 nixies instead. The original idea was to display the hours, then minutes, then the cycle starts again. 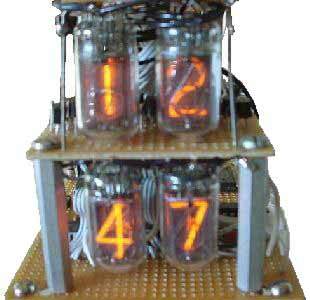 The nixie tubes used in this clock are Burroughs B-5560 tubes that were salvaged from a small broken HP frequency counter. 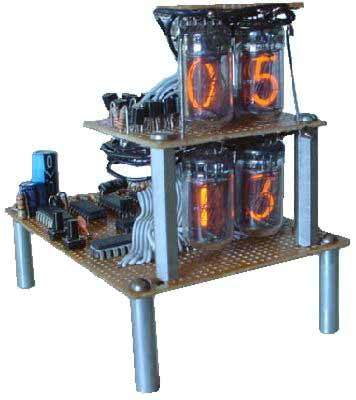 Those nixie tubes are mounted upside down and required a separate board to hold the nixie tubes and cathode transistors. The alternating display idea was to wire the collector ends of the 1 hour transistors to the 1 minute transistors and the 10 hour transistor (I did not use zero for the 10 hours at first) to a 10 minute transistor (only a digit 1 from the 10 hour). The emitter ends of the hour transistors were tied and separate from the tied emitter ends of the minute transistors. This meant I could feed in the signals to all the transistors as if all nixies were present, but one set of transistors' (hours or minutes) emitter ends would be grounded. Therefore, displaying only the hours or the minutes, if both sets of transistors were connected and grounded, the digits would overlap. 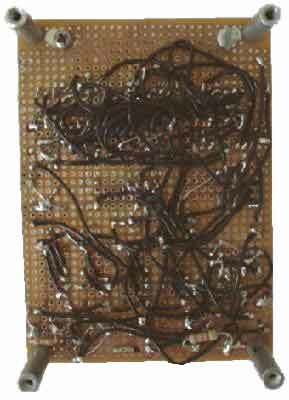 I spent about a day wiring the board with the two nixies and the 27 transistors. I used a ribbon computer cable to carry the signals from the controller board to the switching transistors. It was very difficult to wire the ribbon cable to the two boards since most of the connections are thin and I was using a dull soldering iron. After the first board was completed and wired, I started on the controller board. I had problems with the hours not resetting correctly so I used another 4017 IC instead. I also used another 4017 IC for the 10 hour IC instead of the other 4013 half so I can display zero with my single digit hours (for example; 03:00, not 3:00 with the 10 hour nixie appearing dead). I started on the power supply for both the nixies and controller board. This is the dangerous part of the overall design. 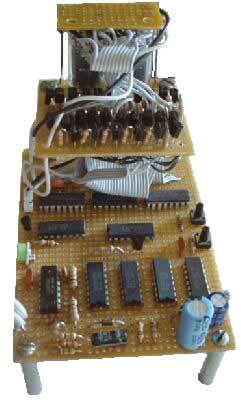 A voltage doubler is used to provide HV to drive the nixies and the HV is also reduced to a few volts for the ICs. The power supply is transformerless so some parts of the circuit can be hot. The two time set switches need reasonably good insulation from the circuitry such as my simple long-pole pushbutton switches salvaged from a VCR. A half of a 4013 IC was used to buffer the 60Hz line. Four 4017 ICs were used to divide the 60Hz line signal to 1/60Hz so you would have to wait 60 seconds for the fourth IC to toggle the 1 minute IC. The other three 4017 ICs are used as counters for the display. The 10 minute IC is wired differently because when it counts to the 7th output (digit 6), that output feeds a signal to the reset trigger to reset the count back to zero. So when the 10 minute counts to 6 (60 minutes) then it resets to 0. The hours IC is a little more tricky. The 1-hour IC starts the display at the digit 1, and counts up to 9, then 0. At the 10th output, the 10 hours IC is incremented from 0 to 1. Also, when the 1-hour IC passes through 3:00 it increments another 4017 used for reset. The second time around when the hours goes from 12 to 13, the 4017 increments and resets itself and both 4017s for the hours display back to 1:00. I added a 50K control in series from the HV+ to the nixie plates to control the nixie brightness. When powering up, the clock will normally display incorrect time, overlapping digits or even count incorrectly. This is normal because the 4017 ICs often power up in odd states. This can be fixed by holding down the fast set button for about 10 to 15 seconds until the clock functions correctly with all the counters resetting themselves back into the expected range of states. After that, you can set the time.